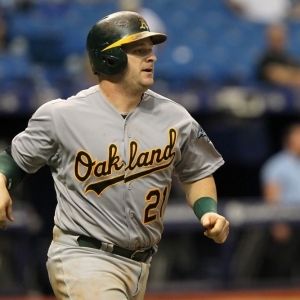 The Oakland Athletics host the Toronto Blue Jays at O.co Coliseum on Thursday. Drew Hutchison is the probable starter for the Blue Jays and he'll face Scott Kazmir of the Athletics. The opening line for this matchup has Toronto at +116 and Oakland at -126. The over/under was set at 7.5. The Blue Jays, with a 48-47 run line record, cover the spread 51% of the time. They also have a 44-44 over/under record. The Athletics are 45-50 against the run line and have a 49-39 over/under record. They cover the spread 47% of the time. The Blue Jays show up with a 48-47 record, including 20-28 on the road. Drew Hutchison has an earned run average of 5.19 and is 9-2 so far on the season while having a 1.47 WHIP. In his starts, the Blue Jays are 12-7 over his 104 innings pitched this season while giving up 121 hits during those innings. Against the over/under, the Blue Jays are 12-7 in his starts. His teammates are averaging 6.8 runs a game when he pitches. The bullpen has given up 240 hits on the season and have a earned run average of 3.57. Opposing teams are hitting .228 against the Blue Jays bullpen while walking 83 times and striking out 279 times. Toronto is averaging 7.06 strikeouts per game while getting 8.76 hits per nine innings as a team. They rank 22nd in baseball in team earned run average at 4.07. Toronto ranks 5th in the league in team batting average at .263 while hitting .250 on the road. The Blue Jays on-base percentage sits at .330, which puts them at 2nd in the league and they have a team slugging percentage of .442. Josh Donaldson leads the team in hits with 105 while the team ranks 6th in baseball with 8.86 hits per game. Oakland is 20-28 at home while holding a 43-52 overall record on the season. Scott Kazmir is starting this game 5-5 for the season with an earned run average of 2.38 and a WHIP of 1.09. In his starts, the Athletics are 8-10 and he has allowed 84 hits over 109.2 innings pitched this season. Against the over/under, the Athletics are 9-8 when he starts. His teammates score an average of 4.1 runs a game when he pitches. The bullpen has given up 239 hits on the season and have a team earned run average of 4.24. Opposing teams are hitting .238 against the Athletics bullpen while walking 97 times and striking out 260 times. Oakland is averaging 7.65 strikeouts per game while getting 7.99 hits per nine innings as a team. They rank 6th in the league in team earned run average at 3.43. They rank 10th in the league in team batting average with a .256 average while hitting .265 at home. The Athletics on-base percentage sits at .316, which puts them at 16th in the league and they have a team slugging percentage of .393. Brett Lawrie leads the team in hits with 90 while the team ranks 9th in baseball with 8.82 hits a game. In terms of team defense, the Blue Jays have a fielding percentage of .984 with 56 total errors, 943 assists and 2,517 put outs. The Athletics have committed 85 errors on the season with 946 assists and 2,529 put outs leading to a team fielding percentage of .976 on the year.